The 67 Texas counties included in this report are: Anderson, Angelina, Austin, Bastrop, Bell, Bowie, Brazos, Brown, Burleson, Caldwell, Camp, Cass, Cherokee, Coleman, Comanche, Coryell, DeWitt, Falls, Fayette, Franklin, Freestone, Gonzales, Gregg, Grimes, Guadalupe, Hamilton, Hardin, Harrison, Henderson, Houston, Jasper, Karnes, Lampasas, Lavaca, Lee, Leon, Liberty, Limestone, Madison, Marion, McLennan, Milam, Mills, Montgomery, Morris, Nacogdoches, Newton, Panola, Polk, Red River, Robertson, Rusk, Sabine, San Augustine, San Jacinto, Shelby, Smith, Titus, Travis (eastern), Trinity, Tyler, Upshur, Walker, Waller, Washington, Williamson, and Wilson. Reduced from over 700 reports of 214 species. Tim Fennell, Winter Report, Williamson County, "This season was colder and wetter than normal. Granger Lake and area stock ponds were out of their banks at season's end. We finished up with a two day ice storm in the last week of the season (2/25-2/26)." David Wolf, "Winter 2002 -2003: Nacogdoches, Lufkin and Lake Rayburn area of the Pineywoods: It seemed as if our winter weather was "normal" this year. Several major cold fronts brought temperatures well below freezing (down to 19 deg F on January 24, the coldest night of the season), but it warmed up between fronts, and none of them brought flooding, ice or snow to any significant degree. Typical winter residents were generally in good numbers, but few staged noteworthy "invasions". Exceptions were Cedar Waxwing, present in large numbers through mid-January but then "moving on", and American Goldfinch, which invaded many feeding stations by the hundreds in January before mostly disappearing in mid-Feb."
Jesse Fagan, Winter TOS Report, East Texas Timberlands, "The first freeze of the season occurred on 11/28/02 when the morning low was 28.5°F . This was the latest first freeze of the year for Overton, TX in the past 6 years. This was not surprising, since most of the fall was wet and warm with mild temperatures (see Region III report for Fall 2002), but several strong, early cold fronts left many feeling like this would be a colder winter. However, weather in between fronts was warm and sunny. This warming and cooling weather pattern continued throughout the season. However, the average daily temperatures for each month were not significantly different from 30-year averages (t-test, all p>>.025, a=.05). Rainfall amounts for December (10.30 inches) and February (7.74 inches) were well above 30-year averages of 4.62 and 3.87 inches, respectively. January at 0.65 inches was well below the 30-year average of 4.36 inches. However, overall precipitation was high and many area lakes and reservoirs were at full capacity throughout the winter." Pacific Loon (probable): (1) 12 January (David Brotherton), Lake Bob Sandlin, Camp County [casual]. Peter Barnes, January, NETFO Newsletter, "Lake Bob Sandlin hosted a probable Pacific Loon on Jan 12, a Western Grebe on Jan 21 (all DB), and 76 Horned Grebe, approximately 50 Greater Scaup, 1 Mottled Duck and 55 Hooded Mergansers on Jan 12." Pacific Loon: (1) 4 February (Petra Hockey, Eric Carpenter), Kennedy Park, Lake O.H.Ivie, Coleman County [casual]. Eric Carpenter, "Petra Hockey and I made our way up to Amarillo a couple days early for the TOS convention and stopped at OH Ivie Reservoir this afternoon. At Kennedy Park (north of dam, off of 1929), we encountered a Pacific Loon, which seemed to have a trace of a chinstrap that could be barely seen in the fading light. The bird was seen at some distance (a scope would be required) west when looking from between the boat ramp/pavilion area. This is nearly the identical spot where a Pacific Loon found by Terry Maxwell, wintered last year." Least Grebe: (1) 7 December (Erik Huebner), FM 1586 (pond on south side of road near US 183), Gonzales County [rare]. Horned Grebe: (76) 12 January (David Brotherton), Lake Bob Sandlin, Camp County [uncommon, but unusually large number]. Eared Grebes, rare in recent years, turned up in many East Texas locations this winter. Eared Grebe: (2) 28 December (Longview CBC), Gregg County [occasional]. Eared Grebe: (6) 4 January (David Brotherton, Walt Brotherton), Lake Murvaul, Panola County [occasional]. Eared Grebe: (1) 11 January (Randy Pinkston), Lake O' the Pines, Marion County [occasional]. Eared Grebe: (1) 4 January (Georgette Guernsey); (2) 15 February (Jesse Fagan, Louis Debetaz, David Wolf, et al. ), Kurth Lake, Angelina County [first area report since 1996]. Peter Barnes, December NETFO Newsletter, "2 Eared Grebes were unusual on the Longview CBC on Dec 28"
Jesse Fagan, Winter TOS Report, "Eared Grebes (Podiceps nigricollis) made a nice showing in the East Texas region this winter. Reports included 2 during the Longview CBC on 12/28/02 (Gregg, ob.? ), 1 at Kurth Lake on 1/4/03 (Angelina, GG), 6 on the Lake Murvaul CBC on 1/4/03 (Panola, DB, WB), 1 at Lake O' the Pines on 1/11/03 (Marion, JP, DR), and 2 at Kurth Lake on 2/15/03 (Angelina, PAS)." David Wolf, "Eared Grebe: a single bird was discovered at Kurth Lake on Jan 4 (GG) and two were there on Feb 15 (JF, LD, DW et al). This is our first area report since 1996. This species was formerly quite regular, sometimes in numbers and at almost any season, but it has been almost non-existent in our region since the mid-80's." Western/Clark's Grebe: (4) 22 December; (1) 21 January (David Brotherton), Lake Bob Sandlin, Camp County [casual]. Jesse Fagan, Winter TOS Report, "A Western Grebe (Aechmophorus occidentalis) was confirmed at Lake Bob Sandlin on 1/21/03 (Camp, DB). Up to four Aechmophorus grebes were present since December at this location." Peter Barnes, December, NETFO Newsletter, "December was warm and devoid of major cold fronts to push down northern birds. Nevertheless, some interesting species were observed. Four Pacific Loons were observed on the Lake Tawakoni Christmas Bird Count (CBC) on Dec 28. Four Western/Clark's Grebes were at Lake Bob Sandlin on Dec 22 (DB), "
American White Pelican: (flocks of 9, 15, 30, 25 and 37) 14 December (College Station CBC), College Station, Brazos County [accidental on this CBC; although pelicans are uncommon at regional lakes it is quite unusual to see them in flight over the city in December, particularly so many flocks]. Neotropic Cormorant: (1) 8 December (David Wolf), TX 147 bridge at Lake Sam Rayburn, San Augustine County [rare]. Neotropic Cormorant: (1) 14 December (Louis Debetaz, Carroll Moore), Kurth Lake, Angelina County [rare]. Neotropic Cormorant: (2) 14 December (David Brotherton), Lake O' the Pines, Marion County [rare]. Jesse Fagan, Winter TOS Report, "Neotropic Cormorants (Phalacrocorax brasilianus) continue to increase in numbers throughout our region. Singles were at the TX 147 bridge on 12/8/02 (DW) and Kurth Lake on 12/14/02 (Angelina, LD, CM) while 2 were seen on the Lake O' the Pines CBC on 12/14/02 (Marion, DB)." Anhinga: (1) 7 December (Darrell Vollert, Bert Frenz, et al. RBAS field trip), FR1375 causeway over northern Lake Conroe, Walker County [occasional in winter]. Anhinga: (1) 14 December (David Brotherton), Lake O' the Pines, Marion County [occasional]. Snowy Egret: (1-3) 9 November to 18 January (Tim Fennell), Meadow Lake, east Round Rock, Williamson County [out of season lingerer; photographed]. Cattle Egret: (6) 3 December (Fred Collins), Pattison Road, Waller County [late departure]. Cattle Egret: (1) 19 December (Shrinand Karuppoor), south of Carlos, Grimes County [late departure]. Cattle Egret: (27) 19 December (Judy Winn, Terry Smith), west of Anderson, Grimes County [late departure]. Cattle Egret: (1) 5 January (Darrell Vollert), Clarann Estate near Chappell Hill, Washington County [out of season lingerer]. Black-crowned Night-Heron: (1) 18 January (Jesse Fagan, Claudia de la Cruz) Ellen Trout Lake, Lufkin, Angelina County [occasional]. Black-crowned Night-Heron: (1) 4 January (Peggy Harding, Sandy Gipson), Lake Murvaul, Panola County [occasional]. David Wolf, Winter Report, Pineywoods Scissor-Tales, "Waterfowl were not especially numerous this winter and were widely scattered. No large rafts of diving ducks were detected on Rayburn after early December, when lake levels began rising, and dabblers were almost non-existent throughout our area this winter." Greater White-fronted Goose: (30) 19 December (David Phalen), Gibbons Creek Reservoir, Grimes County [occasional]. Greater White-fronted Goose: (~100) 19 December (Bert Frenz), over dam at Gibbons Creek Reservoir, Grimes County [occasional]. Greater White-fronted Goose: (1) 22 February to at least 10 March (Peter Barnes, Ron Gutberlet), Texas Eastman in Tyler, Smith County [unusually long stay]. Peter Barnes, February NETFO Newsletter, "A Greater White-fronted Goose stayed for an unusually long period at Texas Eastman in Tyler, from Feb 22 through at least March 10." Ross's Goose: (2 in 40 Snow Geese) 7 December; (3 in 65 Snow Geese) 8 December (Fred Collins), his farm on Repka Road, Waller County. Ross's Goose: (2 in flock of 14 Snow Geese) 8 December (Darrell Vollert), Clarann Estate, Chappell Hill, Washington County. Ross's Goose: (1) 4-year stay continuing through December (fide Peter Barnes), Lake Tyler, Smith County. Peter Barnes, December NETFO Newsletter, "The Ross' Goose continued its 4-year stay at the Lake Tyler concession area and 2 Greater Scaup were also there on Dec 15 (PB)." Ross's Goose: (1 in flock of 6 Snow Geese) 19 December (Bert Frenz), over Carlos Lake, Grimes County [new species for CBC]. Ross's Goose: (5 in flock of 50 Snow Geese) 26 December (Ellen Ratoosh, Darrell Vollert), Clarann Estate, Chappell Hill, Washington County. Mottled Duck: (1) 12 January (David Brotherton), Lake Bob Sandlin, Camp County [occasional]. Blue-winged Teal: (1-4) 2 December to 2 February (fide David Wolf), various locations in Nacogdoches County [occasional]. - a female on a pond near Melrose (Nac Co) on Dec 8 (JF, DW). Then, after no sightings for over a month, a pair was there Jan 20-Feb 2 (JF, CDF, DW)." Cinnamon Teal: (1 male) 15-18 January (Tim Fennell), Meadow Lake, Round Rock, Williamson County [rare]. Cinnamon Teal: (2 males) 16 February (Tim Fennell), Sore Finger Wildlife Area, Granger Lake, Williamson County [rare]. Greater Scaup: (5 females) 5 December (Rich Kostecke), Dana Peak Park, Stillhouse Hollow Reservoir, Bell County [rare]. Greater Scaup: (2) 15 December (fide Peter Barnes), Lake Tyler, Smith County [uncommon]. Greater Scaup: (~50) 12 January (David Brotherton), Lake Bob Sandlin, Camp County [uncommon]. Jesse Fagan, Winter TOS Report, "East Texas can be a good area to find Greater Scaup (Aythya marila) in the winter and small numbers were seen sporadically at several places. Reports included 5-12 at Kurth Lake through 2/15/03 (Angelina, LD, CM, m.o. ), 1-3 at the Nacogdoches Sewage Ponds from 12/15/02-1/1/03 (Nacogdoches, DW, m.o. ), 1-8 at the TX 147 bridge from 11/30/02-2/2/03 (Angelina, JF, DW), and 10 at Texas Eastman in Tyler from 2/22-2/26/03 (Smith, PB, RG)." Greater Scaup: (2+) 23 December (Chris Merkord, Jennifer Reidy); (1) 15 January (Tim Fennell), Old Settler's Park, Round Rock, Williamson County [rare]. Chris Merkord, 23 December, "The pond at Old Settler's Park still has a couple of Greater Scaup on it, which have now been there for a while. There is at least one male and one female, not associating with each other however." Greater Scaup: (5-12) through at least 15 February (Louis Debetaz, Carroll Moore, et al. ), Kurth Lake, Angelina County [uncommon]. David Wolf, "Greater Scaup: small numbers were seen regularly at several places. - 5-12 on Kurth Lake (Angelina Co) through at least Feb 15 (LD, CM et al). - 1-8 at the TX 147 bridge on Rayburn (San Augustine and Angelina Counties) from Nov 30-Feb 2 (JF, DW), the higher counts after the New Year." Greater Scaup: (10) 22 February to 10 March (Peter Barnes, Ron Gutberlet), Lake Palestine, Smith County [occasional]. Peter Barnes, February NETFO Newsletter, "at Lake Palestine ... 10 Greater Scaup were also here from Feb 22-March 10 (PB, RG) and 1 was at Cooper Lake on Feb 27 (MW)." Surf Scoter: (1 female) 26 December (David Wolf); 27 December (Robert Truss), pond near Melrose, Nacogdoches County [casual; sixth area record]. David Wolf, "The female found off TX 147 bridge on Rayburn on Nov 24 was seen again on Nov 30 (DW, RT), but not afterwards. Remarkably, a different female was on a pond near Melrose (Nacogdoches Co) on Dec 26 (DW) and again the next day (RT), but was not again. These are only the 5th and 6th records of this species in our area in 33 years of watching." Common Goldeneye: (2) 19 December (David Phalen), Gibbons Creek Reservoir, Grimes County [occasional]. Common Goldeneye: (1) 9 February (Ron Gutberlet), Lake Palestine, Smith County [occasional]. Barrow's Goldeneye: (1 male) 4 January (Guy Luneau), Lake Murvaul, Panola County [casual; second record for north-east Texas; identification includes a detailed sketch showing field marks observed]. Peter Barnes, January NETFO Newsletter, "The Lake Murvaul CBC on January 4 was spectacular, with 107 species tallied, the second highest ever. The most remarkable sighting was a male Barrow's Goldeneye in Panola Co. (GL). There are only a handful of records of this species for Texas, and this is only the second record for north-east Texas, the first being a specimen taken in Hunt Co. in the 1950s." Jesse Fagan, Winter TOS Report, "One of the most spectacular sightings this reporting period included a male Barrow's Goldeneye (Bucephala islandica) seen in Panola county during the Lake Murvaul CBC on 1/4/03 (GL)." White-tailed Hawk: (1 adult) 28 December (Kim Garwood), Hwy 283, ~10 miles north of Brady, McCullough County [only one prior record shown on Edward's Plateau checklist; identified by white underside, white tail and red shoulders]. Zone-tailed Hawk: (1) 14-17 February (Brush Freeman), Upper Elgin River Rd, Bastop County [casual]. Ferruginous Hawk: (1) 7 December (Erik Huebner), CR 232 near Slaydon Community, Gonzales County [rare]. Ferruginous Hawk: (1 adult light phase) 11 December to 10 February (Fred Collins), Baethe Road between Blinka and Cochran, Waller County [rare; 3rd year in a row at this location]. Golden Eagle - 3 sightings in East Texas this winter - how unusual! Golden Eagle: (1) 7 December (David Weaver), Caddo Lake, Marion County [casual]. Peter Barnes, December NETFO Newsletter, "A Golden Eagle, rare in north-east Texas, was a new bird for the Caddo Lake count on Dec 7 (DW), and another was observed in Fannin Co. on Dec 24 (Robert Truss). " Golden Eagle: (1 immature) 18 January (Carol Wells), Nacogdoches ponds, Nacogdoches, Nacogdoches County [very rare, fifth area record]. David Wolf, "GOLDEN EAGLE: an immature over the Nacogdoches ponds on Jan 18 (CW) was fairly well described. This is our 5th area record and the first since Oct 1990; I only have about 10 additional records for elsewhere in the Pineywoods in the last 30 years." Jesse Fagan, Winter TOS Report, "Golden Eagles (Aquila chrysaetos) are very rare in the East Texas region so three different reports this winter is surprising and unusual. The first report was from the Caddo Lake count on 12/7/02 (Marion?, DWe), another was observed in Fannin county on 12/24/02 (Robert Truss), and the last report was one over the Nacogdoches Sewage Ponds on 1/18/03 (Nacogdoches, CW). This latter report may represent a first January record for this region." Crested Caracaras continue a northern presence where just a few years ago they were rare. Crested Caracara: (2) 9 December (Ken & Patti Couger), Texas A&M University Riverside Campus, Bryan, Brazos County. Crested Caracara: (1) 14 December (Ellen Ratoosh, Lizzie Furuta), Emerald Forest subdivision, College Station, Brazos County [uncommon in area, but quite unusual as a "yard bird" in a residential area]. Ellen Ratoosh, "I just watched a Caracara perched in a snag in the floodplain until it flew off. This is a yard bird, a county first for me, and a lifer for Liz." Crested Caracara: (1 at Dowling Rd); (1 at Elmo Wedon Road) 14 December (College Station CBC), College Station, Brazos County [rare on CBC]. Crested Caracara: (1) 15 December (Darrell Vollert), FR 2447, near Chappell Hill, Washington County. Crested Caracara: (1) 15 December (Clinton Henderson), Hwy 7 at Big Creek, Falls County. Crested Caracara: (1) 19 December (Bert Frenz), rural area north of Gibbons Creek Reservoir, Grimes County [second record for CBC, rare in county]. Crested Caracara: (2) 26 December (Ellen Ratoosh, Lizzie Furuta), SH105, Washington County. Crested Caracara: (1 immature) 11 January (Darrell Vollert), Clarann Estate near Chappell Hill, Washington County. Merlins were reported often this winter in Central and East Texas. Merlin: (1 taiga male) 7 December (Oscar Carmona, Darrell Vollert, Bert Frenz, et al. RBAS field trip), Huntsville State Park, Walker County [very rare in December in East Texas Pineywoods]. Merlin: (1) 26 December (C. Bludau), 6 mi SW of Karnes City, Karnes County [rare]. Merlin: (1) 28 December (Truman Powell), near Trinidad, Henderson County [rare]. Merlin: (1) 30 December (C. Bludau), 1 mile N. of Karnes City, Karnes County [rare]. Merlin: (1 adult male columbarius) 4 January (Tim Fennell), CR 353, Granger Lake area, Williamson County [rare]. Merlin: (1) 18 January (Darrell Vollert, Ellen Ratoosh, 6 others on RBAS field trip), FM159, south Brazos County [rare]. Merlin: (1) 19 January (Truman Powell), north of Trinidad, Henderson County [rare]. Merlin: (1 adult male richardsonni) 23 February (Tim Fennell), Althea Loop, near Granger Lake, Bell County [rare]. Prairie Falcon: (1) 16 or 17 and 24 November to 10 December (Brush Freeman), off 969 west of Bastrop, Bastrop County [rare]. Wild Turkey: (42) 26 December (C. Bludau), 4 mi SW of Karnes City, Karnes County [unusually large number]. Northern Bobwhite: (80+) 1 January (Cypress Creek CBC), most in Waller County [occasional]. Northern Bobwhite: (16) 23 January (Fred Collins), his farm on Repka Road, Waller County [occasional]. Virginia Rail: (1) 15 December (Tim Fennell), marsh on east side of Granger Lake dam, Williamson County [rare]. Virginia Rail: (3) 4 January (Guy Luneau), Lake Murvaul, Panola County [occasional]. Sora: (1) 4 January (Guy Luneau), Lake Murvaul, Panola County [occasional]. Sandhill Crane: (2000 counted, but 3-5000 estimated by calls) 14 December (Cathy Liles, Elaine Owens), Buffalo Ranch, FM50, Brazos bottoms, Burleson County [dramatic increase in wintering population for Central Brazos Valley]. Sandhill Crane: (8) 19 December (Judy Winn, Terry Smith), west of Anderson, Grimes County [very rare on this CBC]. Mountain Plover: from 1 December 2002 to 28 February 2003 with high count (71) 25 January (Tim Fennell), Granger Lake area, Williamson County [rare]. Long-billed Curlew: (12+) 1 January (Bill & Charlotte Neill), Sadberry Rd at Hwy 6, a few miles east of Mumford, Robertson County [rare; first county record]. Long-billed Dowitcher: (3) 20 December (Peter Barnes), Richland Creek WMA, Freestone County [rare]. Long-billed Dowitcher: (1) 22 December (David Brotherton), Lake Bob Sandlin, Camp County [very rare]. Long-billed Dowitcher: (1) 28 December (Longview CBC), Gregg County [very rare]. Jesse Fagan, Winter TOS Report, "Single wintering dowitchers (Limnodromus sp.) included one at Lake Bob Sandlin on 12/22/02 (Camp, DB) and another on the Longview CBC on 12/28/02 (Gregg, observer?). These are very good records for the Pineywoods; Short-billed has never been encountered in the winter and Long-billed is very rare with only a few winter records." American Woodcock: (2) 7 December (Caddo Lake count), Marion County [unusually scarce]. Peter Barnes, December NETFO Newsletter, "The Caddo Lake count on Dec 7 totaled 114 species, the highest total to date, the average total being 106 species. Ducks, American Woodcock (2 birds) and Red-headed Woodpeckers (3 birds) were unusually scarce, but the numbers of other species were high, most notably 8 Great Horned Owls, 9 Marsh Wrens and 431 Rusty Blackbirds." American Woodcock: (36) 4 January (CBC), Lake Murvaul, Panola County [good count]. Little Gull: (1) 28 December (Charles Mills), Lake Wright Patman, Cass/Bowie County [casual]. Peter Barnes, December NETFO Newsletter, "The large lakes of the region are the best place to search for rare gulls, and Lake Wright Patman yielded a Black-headed Gull on Dec 15 and 28 (CM), as well as a Little Gull on Dec 28 (CM)." Jesse Fagan, Winter TOS Report, "Among the best finds this winter included a Black-headed Gull (Larus ridibundus) at Lake Wright Patman from 12/15-12/28/02 (Bowie?, CMi) and a Little Gull (Larus minutus) also at Lake Wright Patman on 12/28/02 (CMi)." Charles Mills, "I was the sole observer for both the Black-headed and Little Gull observed on the Texarkana, TX CBC. Unlike most previous observations of either species, both individuals were separately observed at two sites on the lake's north shore. ... The adult Little Gull was at rest on a mud-bar in the Clear Springs campground. About 600 Bonaparte's Gulls/Forster's Terns were also present on the same mud-bar in about equal proportions. I first noticed the bird's smaller size and stubbier body. These birds have always appeared "neckless" much of the time that I've studied them. The bird was at rest the whole time that I had it under observation; however, it did stretch its wings a couple of time thus revealing the black underwing linings. Also, on the folded wing, the upper surface of the outer primaries were gray not black as they were with the Bonies. Lastly, the bird had a eye-spot and dark hind-part of its crown and reddish legs." Black-headed Gull: (1) 15 and 28 December (Charles Mills), Lake Wright Patman, Cass/Bowie County [casual]. The adult Black-headed Gull flew by my position at Boat Ramp #3 mixed in a small group of about 50 Bonaparte's Gulls. On this date, it was primarily identified on the basis of the blackish undersides to the primaries, larger size, and slightly paler mantle. I can't say that I got a great look at bill color but, on the initial date of discovery, it was noted to be dark red with a black tip." Caspian Tern: (1) 19 December (Dewitt Patton), Gibbons Creek Reservoir, Grimes County [rare]. Eurasian Collared-Dove: (1) 7 December (James Ingold, Terry Davis), Caddo Lake, Marion County [first time on count]. Eurasian Collared-Dove: (2) 19 December (Cathy Liles), Shiro, Grimes County [first time on CBC]. Eurasian Collared-Dove: (2) 19 December (Jim Hughes), on the railroad tracks next to Finfeather Lake near the end of Adkins St., Bryan, Brazos County [rare]. Eurasian Collared-Dove: (1) 17 February (Sandy Dillard), TAMU Riverside Campus, Bryan Brazos County [rare]. Eurasian Collared-Dove: (3) 22 February (Rich Kostecke & Anthony Floyd, a town along Hwy 190, Milam County [second county record]. Barn Owl: (1) 5:15 AM 11 December; (1) 18 December; (1) 20 December; (1) 9 January 2003; (1) 15-16 January; (2, probably different from prior one) 20 January; (1) 21 January; (1) 28 January (Fred Collins), Bathe Road, Waller County [rarely reported]. Eastern Screech-Owl: (12 in 1 hour) 14 December (David Phalen), College Station CBC, Brazos County [impressive number]. Burrowing Owl: (2) 4-11 January (Tim Fennell), one on north side of FM 971 and one at first culvert east of northeast corner of Granger cemetery, Granger Lake area, Williamson County [rare, photographed]. Burrowing Owl: (1) 16 February (Tim Fennell), second concrete pile north of FM 971, ~.8 mile west of CR 358, Granger Lake area, Williamson County [rare]. Short-eared Owl: (1-4) 4-25 January (Tim Fennell), northwest of FM 971 and CR 356, Granger Lake area, Williamson County [rare]. Short-eared Owl: (1) 28 February (Matt White), Franklin County [rare]. Common Nighthawk: (1) 14 December (Betty Vermiere), behind Raintree subdivision, College Station, Brazos County [first time on CBC; no prior December area records]. Common Nighthawk: (1) 28 December (Dorothy Metzler, Diane Jones), Longview, Gregg County [no prior December records for north-east Texas; one other December record for Pineywoods]. Peter Barnes, December NETFO Newsletter, "A freshly killed Common Nighthawk was a remarkable find in Longview on Dec 28 (DM, DJ). However, they have also been seen in Shreveport, with 3 birds seen there on Dec 14 and 2 on Jan 1 (Charles Lyon). This species has not been previously recorded in north-east Texas in December." Jesse Fagan, Winter TOS Report, "A freshly killed Common Nighthawk (Chordeiles minor) was a strange find in Longview on 12/28/02 (Gregg, DM, DJ). There is only one other winter record (also from December) of this species for the Pineywoods." Not only are Buff-bellied Hummingbirds maintaining a summer presence since the mid 90s in the Central Brazos Valley, but for the first time ever, two buff-bellieds have stayed the winter. Bert Frenz, "Prior departure dates I have recorded for the area are: 29 Oct 2001, 9 Sep 2000, 9 Sep 1999 and 11 Oct 1998." Buff-bellied Hummingbird: (1) from 30 March 2002 to at least March 2003 (Marcia Effinger, et al. ), her feeders, Old Chappell Hill Road, Chappell Hill, Washington County [arrived somewhat late this season; reappearing yearly since May 1998; now seems to be year round resident]. Buff-bellied Hummingbird: (1) 27 December 2002 to at least mid March 2003 (Gene & Dorothy Stanford, Darrell Vollert, Fred Collins, et al. ), Brenham, Washington County [rare]. Buff-bellied Hummingbird: (1) 2 February (Brush Freeman), near Utley, Bastrop County [early arrival]. Black-chinned or Ruby-throated Hummingbird: (1-2) mid-October 2002 to at least April 2003 (Fred & Mary Brandt, Darrell Vollert, et al. ), Chappell Hill subdivision, Washington County [Black-chinned very rare in area and unprecedented in winter; Ruby-throateds are very rare in winter and there is no prior record of one for an extended stay]. Darrell Vollert, "On Thursday, November 21 I finally got a good look at Fred and Mary Brandt's hummingbird. It is a female Ruby-throated Hummingbird. She came to their sugar water feeder a couple times and I watched her actively catch small flying insects above yaupon trees in the Brandts backyard." Ellen Ratoosh, 26 December 2002, "Lizzie Furuta and I drove down to Chappell Hill on 12/26 and met Darrell Vollert for a day of bird watching. ... We then visited the Brandts' home in Chappell Hills subdivision. We saw an immature Ruby-throated Hummingbird which has been visiting their feeder. This bird has an entirely white throat, with no colored feathers." Darrell Vollert, 11 January 2003, "In Chappell Hills subdivision north of Chappell Hill ... An immature female Ruby-throated Hummingbird is still present at the residence that is hosting the grosbeak. She has been visiting a sugar water feeder at the residence since October." Darrell Vollert, 2 April 2003, "It is highly likely that this bird is a wintering Black-chinned Hummingbird. Fred and Mary Brandt had two wintering hummingbirds. Fred Collins explained to me that Ruby-throats winter along the coast and Black-chins will winter far inland. Fred gave me a couple very good id tips on Black-chins. He says Black-chins bob their tails more rapidly while hovering than Ruby-throats do. I noticed this behavior with at least one of the Brandt's birds. Fred also stated that Black-chins look grayer in appearance than Ruby-throats do. The two hummers are still present at the Brandts' residence." Bert Frenz, "This wintering hummingbird in Washington County is unprecedented for the Oaks & Prairies region. Black-chinned Hummingbirds are nesting birds of the Edward's Plateau, spilling into the western and southern edge of the Oaks & Prairies region at McLennan, Limestone, Falls, Bell, Williamson, Bastrop, Guadalupe and DeWitt counties. In the more central part of the Oaks & Prairies region, the only records are 6 Apr 2000 and 1 May 2000 at the same feeder in Bryan, Brazos County, and a vaguely recalled sighting sometime in the fall prior to 1996 in Chappell Hill, Washington County. Brush Freeman's new checklist for the Oaks & Prairies region indicates only three winter records and the McLennan County checklist marks the species as rare in winter." Rufous Hummingbird: (1) week of 21 October and still present 14 December; (a second, unidentified, hummingbird) showed up briefly with Rufous in week of 8 December (Susan Schulze), College Station, Brazos County [rare]. Rufous Hummingbird: (1 male) 2 December 2002 to at least 27 January 2003 (Kitty & Jim Anding), Harvey Community, Brazos County [rare]. Rufous Hummingbird: (1 immature male) 4 January (Randy Pinkston, Jesse Fagan), Lake Timpson, Panola County [rare]. Ladder-backed Woodpecker: (1 male) 1 February (Fred Collins), his farm, Waller County [rare]. Fred Collins, "February 1, 2003. On my farm on Repka Road, 1 male Ladder-back Woodpecker investigating fence post perhaps for nesting site. This is I think the third occurrence for the species on my farm, all males. Previous records if memory serves me were May and October. Perhaps you have other Waller County Records. I know that I have seen them west of 359 near Monaville in the 70s or early 80s. P.D.Hulce and Ted Eubanks had also reported them west of 359 in south central Waller County." Red-shafted (Northern) Flicker: (1) 14 December (Betty Vermiere, Chuck Hamilton), Bryan, Brazos County [rare form for CBC]. Red-shafted (Northern) Flicker: (1) 19 December (Tyson Hart, Kim Crumpler, Jason McClure), south of Gibbons Creek Reservoir, Grimes County [rare form]. "Western" Flycatcher: (2) 1 December (Brush Freeman), McKinney Roughs, Bastrop County [casual]. Say's Phoebe: (1) 1 December (Willie Sekula), 9 mi. West of Kenedy, Karnes County [breeding probable - A]. Say's Phoebe: (1-2) 15 December 2002 to 4 January 2003 (Tim Fennell), Granger Lake dam, Williamson County [occasional]. This winter has produced many more Vermilion Flycatcher sightings than usual. Vermilion Flycatcher: (1) 21 November to 16 December (Stan Welso, Brush Freeman, et al. ), Sayer's Road, Crystal Lake area, Bastrop County [occasional]. Vermilion Flycatcher: (1) 17 December; (1) January; (1) 6 January (Fred Collins), Brown Road, Waller County [rare]. Vermilion Flycatcher: (1 male) 2 February, but probably present since 27 October 2002 (Jesse Fagan, David Wolf), island off TX 147 bridge on Lake Sam Rayburn, San Augustine County [very rare]. David Wolf, "Vermilion Flycatcher: a male was spotted on Feb 2 on an island off the TX 147 bridge on Rayburn (JF, DW). It was in the exact same location and plumage as the only seen here on Oct 27, 2002 (JF, DW), and it is quite likely that this bird was present this entire time but remained undetected on our weekly visits to the lake until Feb 2." Vermilion Flycatcher: (1 female) 18 January to 13 February (Frank Bumgardner), Waco sewage treatment ponds, Waco, McLennan County [vagrant, according to McLennan Co. checklist]. Vermilion Flycatcher: (1 male) early January to 2 March (Darrell Vollert), east of Brenham, Washington County [rare; 4th county record]. Ash-throated Flycatchers stretched further east than their typical range. Ash-throated Flycatcher: (1) 19 December (Bert Frenz, Arch Dillard), CR 165 near CR 164, near Keith, Grimes County [casual, first record for CBC and Grimes County]. Myiarchus species, most likely Ash-throated Flycatcher: (1) 19 December (Dewitt Patton), Gibbons Creek Reservoir, Grimes County [very rare]. Dewitt Patton, "Observed 1 from 30 ft. Gray head with crest, light yellow belly, rufous rectricies, rufous bars in wing. Observed 10:30 am for ~3 min. At end of weir on Gibbon's Creek Reservoir." Ash-throated Flycatcher: (1) 19 January (Brush Freeman), Tahitian Village, Bastop County [rare]. Ash-throated Flycatcher: (1) 24 January (Derek Muschalek), 11 miles northwest of Yorktown, DeWitt County [rare]. Great Kiskadee: (1) 23 December (Brush Freeman), Fisherman's Park on Colorado River, Bastrop, Bastrop County [first county record]. Brush Freeman, "Great Kiskadees are rare vagrants outside the typical range of the Lower Rio Grande Valley and South Texas Brushland. The species has nonetheless shown an increasing tendency to wander outside of this typical range, most often in fall and winter. The species has been found from the Upper Texas Coast to the Texas-Oklahoma Border and to Lake Imperial, near Pecos in west Texas. I wish to document herein the first occurrence of this species for Bastrop County, located in South-central Texas. A careful search of the available literature by the author has failed to produce a previous record for this county. On the morning of 23 December 2002, the author was birding a paved river trail in Fisherman's Park, located on the Colorado River in the City of Bastrop. While walking this trail toward the south the author noted a bird in flight over the water near the opposite bank of the river. The fact that the bird appear rufous caught the author's attention immediately and upon looking at the bird through 10 x 50 binoculars, quickly identified it as a Great Kiskadee. The estimated time was approximately 8:15 a.m. The bird perched for approximately 3 minutes in a tree about 10 feet above the river bank before taking flight again, along the bank to the south where it alighted again. It stayed at this perch for 5-6 minutes before sallying forth after some unseen insect. It then flew slightly further south along the bank toward the Chestnut Street bridge where it landed for a couple of minutes, sallying forth once for a prey item. At this point the author decided to continue the walk and did so until the trail's end was reached, whereupon he doubled back on the trail to return to where the kiskadee was found. The bird was not immediately relocated as it was then motionless on a perch, not until the bird took flight was the author able to relocate it. It was observed moving from one perch to another 3-4 more times and seen to dart out from various perches 2-3 times in an apparent effort to secure prey. The author then left the bird and returned home where he notified fellow birders. The author has much experience with the species both within the US and elsewhere." Great Kiskadee: (1) 6 February (Derek Muschalek), Muschalek Road huisache grove, Karnes County [first spring observation]. Couch's Kingbird: (1) 2 November to 21 December (Jesse Fagan, et al. ), Nacogdoches County [first confirmed record for Pineywoods region]. David Wolf, "COUCH'S KINGBIRD: Nov 2-Dec 21, 2002 is full span of dates for this great rarity (first confirmed record for the entire Pineywoods region). First found by Jesse Fagan on Nov 2; it was tape-recorded by Mimi Hoppe Wolf later that day to confirm the id. The bird was seen sporadically through Dec 21, when Rick Schaefer found it for our Nacogdoches CBC, but it was not seen again after that. I saw and heard it several times during this period." Couch's/Tropical Kingbird: (2 Couch's) 10 December 2002 to 6 January (Fred Collins); (1 separated from other 2 seen same day) 1 January (CBC), Betka Road, Waller County [very rare; exactly same locations that Couch's were found by Fred last December]. Fred Collins, 11 December 2002, "Yesterday while on my way home I located two Couch's/Tropical Kingbirds on Betka Road about 1 mile west of FM362. They are in a small stand of brush with a couple of small pine trees just west of the entrance road to 6H Turf and Tree Farm about 100 yards south of Betka Road. This is private property but during good weather, the birds perch in exposed places and are easily visible from the road. These birds are in exactly the same place as the two Couch's Kingbirds I found last December. I presume they to will stick around and eventually be proven to be Couch by playback response. Since I cannot hear the frequency of their call, that job will be left to someone else." Fred Collins, January 1, 2003, re: CBC, "Two parties had three individuals. Two birds associating together at a single location and had been discovered earlier in the month. We were able to relocate them on the count when they answered a Screech Owl tape. They had yellow under parts with the yellow extending all the way across the breast to the white throat. They were brown tailed and had a prominent notch. Close inspection of the tail determined that the outer tail feathers were brown without any white edging or outer web. The birds were grayish above washed especially on the back with greenish. We played Couch's call on tape and they came in within 15-20 feet, perched, became agitated, displayed their orange crowns and called repeatedly; full duet song. Those that were present and can hear the calls reported that they called identically to the tape of Couch's that we played. The degree of aggressiveness was enough to convince me that they were Couch's even though I could not hear them well enough to know what they really sounded like. Sumita Prasad and Don Verser have good bird call skills and they were present for the test & display. Craig Zalk was the 4th member of our party that observed the birds during the 30 minutes we spent observing and testing the birds. For the next hour they often appeared when we played an owl tape. The third individual was on Charter off Penick Road right on the Waller/Harris County. It did not call nor was it tested by tape playing. It was described as a Couch/Tropical type, notched tail with no white in the tail. Fred Collins, January 6, 2003 - Betka Road - 1 Couch's/Tropical Kingbird, presumed to be Couch's. It was on a power line along Betka at the same property where two Couch's were identified by call and playback response on the January 1 CBC. " Scissor-tailed Flycatcher: (1) 20 January (Brush Freeman), Cuero municipal park, DeWitt County [rare in winter]. White-eyed Vireo: (1) 1 December (Brush Freeman), McKinney Roughs, Bastrop County [late departure]. White-eyed Vireo: (1) 14 December (College Station CBC), College Station, Brazos County [rare on CBC]. White-eyed Vireo: (1) 19 December (Cathy Liles), CR 333, Shiro area, Grimes County [very rare on this CBC; rare in winter in region]. White-eyed Vireo: (1) 4 January (Guy Luneau), Lake Murvaul, Panola County [occasional]. White-eyed Vireo: (1) 11 January (Darrell Vollert), Clarann Estate near Chappell Hill, Washington County. Blue-headed Vireo: (2) 1 December (Brush Freeman), McKinney Roughs, Bastrop County. Green Jay: (1) 20 January (Willie Sekula), CR 214, 3 mi. SW of Falls City, Karnes County. Horned Lark: (1) 14 December (Guy Luneau), Lake O' the Pines, Marion County [occasional]. Purple Martin: (1 pair) 10 February; (4) 11 February (Sandy Dillard), his yard, Bryan, Brazos County [FOS for Central Brazos Valley]. Purple Martin: (1) 11 February (Robert Truss), Diboll, Angelina County [FOS East Texas]. Tree Swallow: (1) 26 February (Tim Fennell), Meadow Lake, Round Rock, Williamson County [FOS]. Northern Rough-winged Swallow: (1) 26 February (Tim Fennell), Meadow Lake, Round Rock, Williamson County [FOS]. Cave Swallow: (at least 2 roosting in old Cave Swallow nests) 8 February (Tim Fennell), culvert under I-35, Round Rock, Williamson County [FOS]. Cave Swallow: (2) 26 February (Tim Fennell), Meadow Lake, Round Rock, Williamson County. Barn Swallow: (1) 18 February (Srinand Karuppoor), next to Zachry Bldg, TAMU campus, College Station, Brazos County [early arrival; ties with prior earliest record for the Central Brazos Valley]. Barn Swallow: (3) 26 February (Tim Fennell), Meadow Lake, Round Rock, Williamson County [occasional]. Red-breasted Nuthatch: (1) 6 December to at least 13 February (Carroll Moore), Nacogdoches, Nacogdoches County [only area sighting this season for all 67 counties!]. David Wolf, "Red-breasted Nuthatch: one in Nacogdoches Dec 6 to at least Feb 13 was the only one found all winter (CM). Obviously an "off" year for this species." White-breasted Nuthatch: (1) 2 January (James Phelps), Shenandoah Subdivision, College Station, Brazos County [rare]. Were Winter Wrens more common this winter than most? Winter Wren: (2-3) 1 December (Brush Freeman), McKinney Roughs, Bastrop County. Jim Hinson, "On the subject of Houston area Winter Wren populations, it does appear that we may be having an invasion year of sorts. Winter Wren's, being a species not always seen here during winter, (at least by me and numerous others), are showing up in several of the more wooded areas around town, and in numbers. Houston Audubon's E.L. Moore, The Houston Arboretum, and Bear Creek Park, are all holding them this year. Any comments on past years' numbers, and/or factors contributing to increased winter numbers, would be appreciated." Winter Wren: (1 heard only) 7 December (Darrell Vollert), Christmas Creek Nature Preserve, Montgomery County. Winter Wren: (1 heard only) 7 December (Darrell Vollert, Bert Frenz, et al. RBAS field trip), FR1375 causeway over northern Lake Conroe, Walker County [uncommon]. Winter Wren: (1) 19 December (Tyson Hart, Kim Crumpler, Jason McClure), south of Gibbons Creek Reservoir, Grimes County [occasional]. Winter Wren: (1) 19 December (Rob Tizard, et al. ), TMPA mining area near Gibbons Creek Reservoir, Grimes County [occasional]. Winter Wren: (1) 3 November; (1) 9 November; (1) 16 November; (1) 24 November; (2) 30 November; (1) 8 December; (1) 21 December; (1 w/o tail) 26 December; (1) 4 January; (1) 11 January (Darrell Vollert), Clarann Estate, Chappell Hill, Washington County [occasional]. Golden-crowned Kinglets arrived early (mid-October) and stayed in unusually large numbers in the Oaks & Prairies region through at least December and in some areas through the end of winter. Bert Frenz, 26 December, "On the Gibbons Creek CBC (Grimes County), 8 of 11 groups reported Golden-crowned Kinglets. In the past decade, counts varied from 2-21 with an average of 7.5 per CBC. The 2002 count was 27. In the past decade, the ratio of Ruby-crowned versus Golden-crowned Kinglets has been almost 17 to 1. This year the ratio was 7.5 to 1, reflecting the marked increase in the number of Golden-crowned Kinglets this season." Ellen Ratoosh, 24 December, Brazos County, "Golden-crowned Kinglet - several heard, these seem much commoner than usual this year." Ellen Ratoosh, 27 December, "I continue to hear many Golden-crowned Kinglets in the neighborhood." Tim Fennell, Winter Report, Williamson County, "Golden-crowned Kinglet: Abundant and easy to find throughout the season. Any patch of woods contained at least a couple." Wood Thrush: (1) 18 January (Darrell Vollert, Ellen Ratoosh, 6 others on RBAS field trip), Washington-on-the-Brazos SHP, Washington County [extremely rare in winter; no well documented records for region]. Darrell Vollert, "During a Rio Brazos Audubon sparrow field trip at Washington-on-the-Brazos SHP this past Saturday we found a Wood Thrush. The thrush was foraging on a hillside near the beaver pond along the nature trail. The park is located in extreme northwest Washington County." American Robins were especially abundant this winter. Bert Frenz, "Gibbons Creek CBC (Grimes Co.) had 21,602 robins, the highest count in a decade." Brush Freeman, 24 December, Bastrop County, "There are a few Pine Siskins, Goldfinches and a bazillion Am. Robins on the property today. The robins and Hermit Thrushes have virtually stripped every berry off my big pyrrocanthea (sp?) which was absolutely loaded with berries this time last week." Frank Bumgardner, Winter report, McLennan County, "I had hundreds of both American Robins and Cedar Waxwing from 12th of December thru the 5th of February feeding on the privet berries in the yard." Tim Fennell, Winter Report, Williamson County, "American Robin: Extremely abundant this season in all habitats. Many hundreds to thousands were the rule on any outing." Jesse Fagan, Winter TOS Report, East Texas Timberlands, "
many CBC's experienced near record high counts. Good to exceptional numbers of American Robins, Cedar Waxwings, Rusty Blackbirds, Common Grackles, and American Goldfinches were reported. It is clear that ground-foraging species (e.g. American Robin and Rusty Blackbird) experienced adverse conditions (frozen ground?) to the north and contributed to their increase into our region. However, Purple Finch and Pine Siskin must be finding favorable conditions and food (large seed crop or backyard feeders?) to the north that prevent them from making the journey south. It did appear that winter conditions to the north were extreme and snowfall amounts were above average." Gray Catbird: (1) 28 December (Longview CBC), Gregg County [occasional]. Gray Catbird: (1) 28 December (Truman Powell), Trinidad, Henderson County [occasional]. Gray Catbird: (4) 4 January (Randy Pinkston, Jesse Fagan, David Weaver, Eddie Ray), Lake Murvaul, Panola County [occasional; good count]. Gray Catbird: (1) 12 February (Darrell Vollert), Chappell Hill, Washington County [early arrival]. Darrell Vollert, "This morning I saw and heard a Gray Catbird calling in my Chappell Hill neighborhood. The catbird was foraging in an American Holly tree. The previous early date for this species in Washington County was March 1, 2001." Like American Robins and Golden-crowned Kinglets, Cedar Waxwings arrived already in November and stayed in record numbers. But in the case of waxwings, most left the area in January, perhaps moving to Mexico. Heather Mathewson, 2 December, Brazos County, "Cedar waxwings showed up yesterday for the first time this year but today there must be about 30-40 in the trees in my backyard (Glade St, CS)!! (I'm averaging about 35 with each count). I've never seen so many in my trees at one time! " Bert Frenz, 14 and 19 December, Brazos County, "I counted 783 in my area for the College Station CBC and 1668 in my area for the Gibbons Creek CBC. On the Gibbons Creek CBC, 10 of 11 groups reported waxwings, for a total of 3093. Ellen Ratoosh, 27 December, Brazos County, "... the number of waxwings is notable." Frank Bumgardner, McLennan County, "I had hundreds of both American Robins and Cedar Waxwing from 12th of December thru the 5th of February feeding on the privet berries in the yard." Jesse Fagan, Winter TOS Report, East Texas Timberlands, "Cedar Waxwings and American Goldfinches were in large concentrations early in the season (December), but seemed to disappear sometime in January, possibly to areas further south. Ironically, on my recent trip to El Salvador I saw several hundred Cedar Waxwings. Were some of these flocks birds that had left Nacogdoches sometime in January?" Typical winter residents were generally in good numbers, but few staged noteworthy "invasions". Exceptions were Cedar Waxwing, present in large numbers through mid-January but then "moving on", and American Goldfinch, which invaded many feeding stations by the hundreds in January before mostly disappearing in mid-Feb."
Bert Frenz, Winter in Mexico, "I've birded Mexico and Belize extensively for the past 4 winters, but have rarely found Cedar Waxwings (5 sightings in 3 winters totaling 195 days of birding). This winter I spent more time in Mexico's central plateau and I had 8 sightings in 3 weeks (17 January to 20 February), mostly of large flocks of 100s of birds. In March, I found good numbers along the Gulf Coast from 15-16 March and in the central plateau 21-23 March. It could be that Texas waxwings in December and early January were Mexico waxwings from mid January through March." Pine Warblers were more common than usual in the Oaks & Prairies region this winter. For example, 8 of 11 groups on the Gibbons Creek CBC (Grimes County) reported Pine Warblers, for a total of 113 birds, the second highest count since its inception in 1985. Tim Fennell, Winter Report, Williamson County, "Pine Warbler: Abundant and easy to find through the end of December." Pine Warbler: (15) 2 February (Willie Sekula, Derek Muschalek), Cibolo Creek near Pawelekville, Karnes County [unusually large number]. 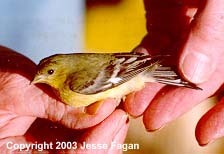 Pine Warbler: (1) 22 February (Rich Kostecke, Anthony Floyd, Milam County [second county record]. Palm Warbler: (1) 19 January (Brush Freeman), Tahitian Village subdivision, Bastrop County [occasional]. Black-and-white Warbler: (1) 21 December (David Wolf), Alazan Bayou WMA, Nacogdoches County [rare in winter]. Black-and-white Warbler: (1) 26 December (Derek Muschalek), McKinney Roughs, Bastrop County [rare]. Black-and-white Warbler: (1) 22 February (Brush Freeman), Utley, Bastop County [rare in winter]. Louisiana Waterthrush: (1) 14 September and 2 October and 21 and 28 December and 15 February (Darrell Vollert), Clarann Estate, near Chappell Hill, Washington County [no prior record of this species having wintered in the Oaks & Prairies region]. Darrell Vollert, 22 December, "Yesterday I conducted my weekly bird survey of the Clarann Estate. The estate is located just north of Chappell Hill in eastern Washington County. The estate lies on 62 acres between Old Chappell Hill Road and FM1155. Turned up what I think are some interesting birds for the Central Brazos Valley. The most unexpected bird I found yesterday at Clarann was a Louisiana Waterthrush. Found this bird along a creek north of the Polk's Lake dam shortly before noon. Noted a white supercilium that broadened behind the eye, a white throat, bold streaking on the breast and sides, buffy flanks, and the waterthrush bobbed its tail in a semi-circular motion. Could this be the same La. Watertrush that I found at the estate in mid-September and in late January [actually 28 December] of this year? The birds were found in the same general area at the estate. There is good habitat for waterthrushes at the estate, as three creeks traverse the property." Louisiana Waterthrush: (1) 15 January and 3 February (Guy Luneau), Rusk County [very rare in winter; probably only one other record for East Texas Pineywoods]. Jesse Fagan, Winter TOS Report, "Another fabulous wintering warbler included a Louisiana Waterthrush (Seiurus motacilla) observed first on 1/15/03 and again on 2/3/03 (Gregg, GL). There is only one other winter record for this species in East Texas." Wilson's Warbler: (1) 26 December (Derek Muschalek), McKinney Roughs, Bastrop County [rare out of season lingerer]. Yellow-breasted Chat: (1) 31 December (Tim Fennell), Rivery Park, Georgetown, Williamson County [out of season lingerer; no prior winter records for Oaks & Prairies region]. Western Tanager: (1 male) 4 January (Robert & Fran Moore); 11 January (Jesse Fagan); 19 January (Carol Wells), Appleby Sands Road, northeast of Nacogdoches, Nacogdoches County [casual; fourth area record]. David Wolf, "Western Tanager: a male (apparently adult) showed up at the home of Robert and Fran Moore on Appleby Sands Road (just ne. of Nacogdoches town) around Jan 4, and was confirmed and photographed on Jan 11 (JF). It was still present through at least Jan 19 (CW). This is only our 4th area record (second in winter; one each for spring and fall). To my knowledge all other Pineywoods records have been in the sw. of the region (Huntsville/Livingston area) and not for some years now (none for NETFO reporting area)." Western Tanager: (1 female) 3 November and 25 January (Darrell Vollert), Clarann Estate, Chappell Hill, Washington County [casual; only the second (and third) record for the RBA area]. Darrell Vollert, "Saw the tanager on January 25 on the west side of the Clarann estate. The bird was in a loblolly pine tree. This was the same bird as the one I found in November at the estate." Western Tanager: (1 adult male) ~4 February to 21 March (Alice Cornwell), Toledo Bend Lake north of Milam, Milam County [very rare; first county record]. Alice Cornwell, "My husband and I are "Winter Texans" on Toledo Bend Lake north of Milam. A male Western Tanager has been at our feeders for a week. At first, we thought it was a goldfinch w/summer plumage, but realized it was too fat and chunky. He looks just like the picture in Sibley's Guide and on the back cover. He has orange/red streaks on the top of his head, the top wing bar is bright yellow, the bottom wingbar is paler, bright yellow on his back and breast, and a tanager beak. He feeds w/gold finches and cardinals." Spotted Towhee: (1 male) 7 December (Georgette Guernsey, David Wolf), Alazan Bayou WMA, Nacogdoches County [occasional]. David Wolf, "Spotted Towhee: at least two good sightings this winter. I still can't say for sure just how regular (or irregular and rare) this species is in our area, or south of us (they are more regular to the north and especially nw. in the Pineywoods, but even there greatly outnumbered by Eastern). One at Swede Johnson Rec Area (Shelby Co). on Nov 14 was far to the east and rather early (RH); one male at Alazan Bayou WMA (Nac Co) on Dec 7 (GG, DW)." Eastern Towhee: (3) 1 December (Brush Freeman), McKinney Roughs, Bastrop County [rare]. Eastern Towhee: (1) 19 December (Mike Manson), east of Gibbons Creek Reservoir, Grimes County [occasional]. Eastern Towhee: (1 male) 21 December (Darrell Vollert), Clarann Estate, Chappell Hill, Washington County [occasional]. Eastern Towhee: (1) 3 January (Rich Kostecke), west of Lometa, Lampasas County [rare; west of normal range]. Canyon Towhee: (1) through at least 25 February (Scott Summers, fide Rich Kostecke), north side of Copperas Cove, Coryell County [eastern edge of range]. Clay-colored Sparrow: (1) 2 February (Derek Muschalek, yard of Willie Sekula, Wilson County [rare in winter]. Clay-colored Sparrow: (1) 2 February (Guy Luneau), TXU mine north of Henderson, Rusk County [casual in winter]. Peter Barnes, February NETFO Newsletter, "Although Clay-colored Sparrows are regular spring and fall migrants, they are rarely observed in mid-winter." Lark Bunting: (~100) 10 December (Brush Freeman), Hwy 304, Gonzales County [unusually large number]. Grasshopper Sparrow: (2) 19 December (Cathy Liles), Shiro area, Grimes County [rare]. Grasshopper Sparrow: (1) 19 December (Karen Russell, Jeffrey Musser, Joan Dziezyc), east of Anderson, Grimes County [rare]. Grasshopper Sparrow: (38) 27 January (Derek Muschalek), 11 miles northwest of Yorktown, DeWitt County [unusually large number]. Henslow's Sparrow: (2) 14 December (Rob Tizard), behind Bentwood subdivision, Wellborn area, Brazos County [rare]. Henslow's Sparrow: (1) 19 December (Sandy Dillard), north of TMPA mining area and Gibbons Creek Reservoir, Grimes County [very rare; second record for CBC]. Henslow's Sparrow: (9) 4 January (Randy Pinkston, Jesse Fagan), near Timpson, Shelby County [occasional]. Harris's Sparrow: (1 observed singing, accompanied by 4 non-singing) 14 December (Bert Frenz), Leonard Road, Bryan, Brazos County [rarely sing in winter]. Harris's Sparrow: (1) 21 December (Eddie Ray), Sabine Mining Company land, Harrison County [occasional]. Harris's Sparrow: (5) 2 February (Willie Sekula, Derek Muschalek), Cibolo Creek near Pawelekville, Karnes County [occasional]. Harris's Sparrow: (1) 25 January to 28 February (David Brotherton), at feeder, Daingerfield, Morris County [occasional]. McCown's Longspur: (100) 12 December (Tim Fennell); (50+) 23 December (Chris Merkord, (Jennifer Reidy, CR 353, Granger Lake area, Williamson County [rare]. McCown's Longspur: from 5 December 2002 to 28 February 2003, with high count of (500+) 25 January (Tim Fennell, et al. ), Hunt-Jones Road, Bell County [rare]. Lapland Longspur: (~35) 18 January (Darrell Vollert, Ellen Ratoosh, 6 others on RBAS field trip), in flight over the fields along FM159 near the first gin encountered driving north on FM 159 from SH 105, south Brazos County [rare]. Lapland Longspur: from 15 December 2002 to 25 January 2003, with high count of (250+) 25 January (Tim Fennell), Hunt-Jones Road, Bell County [rare]. Smith's Longspur: (21) 28 February (Matt White), Franklin County [rare]. Pyrrhuloxia: (1) 1 December (Brush Freeman), McKinney Roughs, Bastrop County [occasional]. Pyrrhuloxia: (1) through at least 25 February (Scott Summers, fide Rich Kostecke), north side of Copperas Cove, Coryell County. Black-headed Grosbeak: (1 female) 16 December 2002 to 20 January 2003 (Ceal Sterling), Liberty, Liberty County [casual]. Black-headed Grosbeak: (1 immature) 23 December 2003 to at least 11 January 2003 (Darrell Vollert, et al. ), Chappell Hill subdivision, Washington County [casual]. Darrell Vollert, 23 December, "A hatch-year male Black-headed Grosbeak appeared in a yard near Chappell Hill in eastern Washington County this morning. This afternoon I visited with the hosts of the bird in Chappell Hills Subdivision and we saw the grosbeak on several occasions. The grosbeak is frequenting their feeding station. We also observed the grosbeak eating lichen on a chinaberry tree and the grosbeak was observed eating mistletoe berries and soapberries. This is the fifth record for Black-headed Grosbeak in Washington County. Four of the birds have been seen in the Chappell Hill area and the other grosbeak was seen in the Zionsville community. " Darrell Vollert, 6 April, "The first-winter male Black-headed Grosbeak was present at the Brandt's residence from Monday, December 16, 2002-Saturday, January 20, 2003. Mary Brandt got excellent photos of the grosbeak eating at her bird feeders." Yellow-headed Blackbird: (1) 31 January (Brush Freeman), County Line Rd., Bastrop County [very rare in winter]. Rusty Blackbird, a species that seems to have declined in Central and East Texas, was reported more often than usual this winter. Rusty Blackbird: (431) 7 December (observers? ), Caddo Lake count, Marion? County [uncommon]. Rusty Blackbird: (11) 14 December (Brush Freeman), Utley, Bastop County [rare]. Brush Freeman, "This morning I stepped outside, and found the property engulfed with 1000's of Am. Robins. singing, calling, cleaning out the yaupon berries etc. As I was filling the feeders I heard Rusty Blackbirds in the understory 100+ feet from the house. I was to go out for a bit of birding this morning but this stopped me for the time being. So far I have counted at least 8-9 blackbirds from inside the house. This is only the second time I have ever seen these animals on my property. They seem to be happy working the understory with the oodles of Robins. The birdbath is ringed with robins despite the fact there is plenty of standing water in the area. I have not seen the siskins of Thursday again but still have quite a few Am. Goldfinches and numerous Pine Warblers. Will see what the rest of the day brings. It is a beautiful day but was cold this morning @ 35.4. I ended up with a count of 11 Rustys, the males are all in basic plumage now and the females are actually the prettier of the two IMHO. The mask on one gal that I had in sunlight was particularly distinctive. For some reason, perhaps with the passing of an unseen accipter etc, the vast bulk of robins suddenly departed around 10:00 with a audible swoosh of many wings and taking the blackbirds with them. The afternoon in the yard turned very quiet. A single gnatcatcher was all of note." Rusty Blackbird: (15) 21 December (Brush Freeman), Pecan Orchard on Hill's Prairie, Bastop County [rare]. Rusty Blackbird: (200) 26-27 December; (50) 15 January (Guy Luneau), Rusk County [uncommon]. Rusty Blackbird: ("small numbers") January (Jesse Fagan, Georgette Guernsey, Mimi Hoppe Wolf), Nacogdoches ponds and Alazan Bayou WMA, Nacogdoches County [uncommon]. David Wolf, "Rusty Blackbirds visit us only during the coldest winter weather, but small numbers were at the Nacogdoches ponds and Alazan Bayou WMA in January (Jesse Fagan, Georgette Guernsey, Mimi Hoppe Wolf), ..."
Rusty Blackbird: (83) 4 January (Guy Luneau, Randy Pinkston, Jesse Fagan), Lake Murvaul, Panola County [uncommon]. Rusty Blackbird: (45) 30 January (Georgette Guernsey), Ryan Lake, Angelina County [uncommon]. Jesse Fagan, "Rusty Blackbirds (Euphagus carolinus) seemed to be conspicuous and (un)common this winter. Several reports included 431 seen on the Caddo Lake count on 12/7/02 (Marion?, observer(s)? ), 200 in Rusk county from 12/26-12/27/02 (GL), and a flock of 45 at Ryan Lake on 1/30/03 (Angelina, GG)." Rusty Blackbird: (2-19) 5 January to 12 February (Frank Bumgardner, John Muldrow, Gary Waggerman), Waco sewage treatment ponds, Waco, McLennan County [rare]. Frank Bumgardner, "John Muldrow and I found 2 Rusty Blackbirds on the road into the Waco sewage treatment ponds on 5 January. The birds remained in the area through 12 February. We had a high of 19 on 9 February. Gary Waggerman and I had 3 on 12 February, the last date reported." Great-tailed Grackle: (1 female) 20 December (Jesse Fagan), Wal-Mart parking lot, Nacogdoches, Nacogdoches County [first county record]. David Wolf, "Great-tailed Grackle: Nacogdoches finally got it's first county record, a female seen on Dec 20 only (JF). Amazing that it has taken us this long to get a record of this expected species, but in spite of a slow expansion around the perimeter of the Pineywoods region this species still has not penetrated it to any degree (apart from the Houston suburbs at the southern edge of the region). There are several records for Angelina County already." Bronzed Cowbird: (1 male) 24 December (Doug Holder), Nacogdoches, Nacogdoches County [second Pineywoods regional record]. David Wolf, "BRONZED COWBIRD: after finally getting the first record for the entire Pineywoods region last May, we now have a second record already: a male at a feeder in Nacogdoches town on Dec 24 (DH)." Baltimore Oriole: (1 female) 11 January (Peggy Harding), Rusk County [very rare in winter]. Peter Barnes, January NETFO Newsletter, "Perhaps because of the warm winter, unusual wintering birds included a White-eyed Vireo at Lake Wright Patman in Cass Co. on Jan 12 (MD), a Louisiana Waterthrush in Russ Co. on Jan 15 and Feb 3 (GL), and a female Baltimore Oriole in Rusk Co. on Jan 11 (PH). Other wintering orioles have been reported in Louisiana." Jesse Fagan, Winter TOS Report, "A female Baltimore Oriole (Icterus galbula) on 1/11/03 represents only one of a handful of wintering records for this species (Rusk, PH)." Baltimore Oriole: (1 female/immature) 11 January to at least 15 February (Darrell Vollert), Clarann Estate near Chappell Hill, Washington County [rare in winter]. Darrell Vollert, 11 January, "The imm. Baltimore Oriole was originally found in association with 5 female Red-winged Blackbirds in a water oak on the south side of the estate near Ash Creek. The oriole then flew into a thick stand of yaupon hollies along the creek. The bird spent a couple hours foraging in yaupon hollies and pecan trees along the creek. I noted an orange throat and breast on the bird and the undertail coverts were orange. All of the tail feathers were light orange. The bird had two white wingbars. I heard the harsh "ch-ch-ch-ch" call of the oriole several times." Darrell Vollert, "Yesterday morning (2/15) I conducted my weekly bird survey at the Clarann estate. ... A female/imm. Baltimore Oriole was seen on the east side of the estate along FM1155. This bird has been present at the estate since at least mid January." Purple Finches, nearly absent from their normal wintering sites in the Pineywoods of East Texas, showed up in the Lost Pines of Bastrop County and a few other Oaks & Prairies region sites. Purple Finch: (3, including 1 male) 1 December (Brush Freeman), McKinney Roughs, Bastrop County [rare]. Brush Freeman, "I was on Deep Sandy when I encountered a flock of 100-150 Am. Goldfinches, ~25 House Finches, RW Blackbirds various sparrows etc. I was pouring through them in hopes of finding Pine Siskins but I was not careful and was not looking at the House Finches closely, Suddenly I heard a song that I had not heard in at least a decade and looked toward the top of a bare pecan and was astonished to see a male Purple Finch, quickly followed by at least two female types nearby. I was elated! The male sang many more times allowing me to somewhat ingrain that song in my memory. What a finer song! These are the first PUFI I have seen in this part of the state since the winter of 91/92 I think. Suddenly the entire flock of birds took off to the south a bit but I did not follow." Purple Finch: (14) 16 December (Brush Freeman), Bastrop State Park Golf Course, Bastrop County [rare]. Brush Freeman, "This morning I birded 9 locations though briefly. I found a fair sized flock of at least 14 Purple Finches near the west end of the golf course in Bastrop State Park in company with many E. Bluebirds, Waxwings, Chipping Sparrows, Myrtle & Pine Warblers, House Finches, Am. Goldfinches etc. Many of those birds were drinking and bathing in shallow water areas near this entrance." Purple Finch: (1) 19 December (Judy Winn, Terry Smith), west of Anderson, Grimes County [rare]. Purple Finch: (1 female) "stayed for 3 mos total from early January / late December through March" (Sandy Dillard), Bryan, Brazos County [rare, photographed]. Purple Finch: (1) 2 January (Robert Truss); (1) several weeks in late January (Ruth Heino, Shirley Hughes), Nacogdoches County [very scarce this winter in NETFO area]. David Wolf, "Purple Finch: almost non-existent this winter and only two singles were found: 1 in Melrose (Nacogdoches Co) for one day (Robert Truss); 1 in Nacogdoches for several weeks in late January (Ruth Heino, Shirley Hughes)." Jesse Fagan, Winter TOS Report, "Late freezes, warming and cooling trends, and high rainfall amounts, what affect did this have on birds in the East Texas region? ... The warmer temperatures between fronts may have helped a few species hang around (winter?) longer than expected. ... Absent from all of this activity were the seed-finches. Purple Finch and Pine Siskin were nearly absent from the Pineywoods this winter. The few reports are listed below. It is clear that ground-foraging species (e.g. American Robin and Rusty Blackbird) experienced adverse conditions (frozen ground?) to the north and contributed to their increase into our region. However, Purple Finch and Pine Siskin must be finding favorable conditions and food (large seed crop or backyard feeders?) to the north that prevent them from making the journey south. It did appear that winter conditions to the north were extreme and snowfall amounts were above average." Pine Siskins showed up in very small numbers in a few Oaks & Prairies region sites, but were extremely scarce in their normal winter haunts of the East Texas Pineywoods. Pine Siskin: (1 heard only) 7 December (Darrell Vollert), FR1791 pull-out at Montgomery County line, Walker County. Pine Siskin: (4) 21 December (Brush Freeman), Pecan Orchard on Hill's Prairie, Bastrop County. Pine Siskin: (8) 24 December (Brush Freeman), near Utley, Bastrop County. Pine Siskin: (1) 24 December (Ellen Ratoosh), Emerald Forest subdivision, College Station, Brazos County. Pine Siskin: (1) 24 December (Derek Muschalek), 8 miles southwest of Yorktown, DeWitt County [rare]. Pine Siskin: (1 calling in flight) 5 January (Darrell Vollert), Clarann Estate near Chappell Hill, Washington County. Pine Siskin: (6) 12 January; (7) 14 January (Brush Freeman), near Utley, Bastrop County. Pine Siskin: (3) 3 February (David Brotherton), Dangerfield, Morris County [very few reports this winter]. Jesse Fagan, Winter TOS Report, " Purple Finch and Pine Siskin were nearly absent from the Pineywoods this winter. The few Pine Siskin (Carduelis pinus) reports included 1-2 in Nacogdoches from 12/5/02-2/6/03 (Nacogdoches, CM) and 3 in Dangerfield on 2/3/03 (Morris?, DB)." Pine Siskin: (1-2) 5 December to 6 February (Carroll Moore), Nacogdoches; (1) 19 December to early February (fide David Wolf), Loco Valley; (1) 20 January to 9 February (Mimi Hoppe Wolf), Central Heights, all sightings in Nacogdoches County [few reports this winter]. David Wolf, Pineywoods Scissor-Tales, March 2003, "Pine Siskin: a very few were spotted amidst the hordes of goldfinches, but it obviously was an "off" year for this species. The only records that I was able to track down were: 1-2 in Nacogdoches town from Dec 5-Feb 6 (Carroll Moore), 1 in Central Hts (Nac Co) from Jan 20-Feb 9 (Mimi Hoppe Wolf), 1 in Loco Valley (Nac Co) from Dec 19 through early Feb."
Lesser Goldfinch: (1 immature male) 5 January (Charles Ely), Nacogdoches, Nacogdoches County [first record for Pineywoods region]. David Wolf, "LESSER GOLDFINCH: this species was the great surprise of the season and a first record for the entire Pineywoods region. An an immature male was captured, banded and photographed in Nacogdoches town on Jan 5 by master-bander Charles Ely and "netted again a few days later". I did not hear of it being seen or caught again after that. Jesse Fagan rushed over and got good in-the-hand photographs of the bird on Jan 5." American Goldfinch were particularly abundant this winter, but left the area in mid-February. David Wolf, "American Goldfinch: most local feeding stations were "swamped" by hundreds of American Goldfinches by early January, but suddenly in mid-February the great numbers abruptly disappeared (m. obs.)." American Goldfinch: (flock of 100-150) 1 December (Brush Freeman), McKinney Roughs, Bastrop County [good count so early in season]. American Goldfinch: (28) 14 December; (50+) 22 December (Ellen Ratoosh, Lizzie Furuta), Emerald Forest subdivision, College Station, Brazos County. Ellen Ratoosh, "Although I have an abundance of Am. Goldfinches at my feeders (50+), I haven't seen any Siskins yet or Purple Finches." American Goldfinch: (262) 19 December (Gibbons Creek CBC), Grimes County [notably, 10 of 11 groups reported goldfinches]. Kitty & Jim Anding, Keith Arnold, Peter Barnes, C. Bludau, Fred & Mary Brandt, David Brotherton, Walt Brotherton, Frank Bumgardner, Jeanette Bumgardner, Oscar Carmona, Eric Carpenter, David Cimprich, Fred Collins, Alice Cornwell, Ken & Patti Couger, Kim Crumpler, Terry Davis, Louis Debetaz, Claudia de la Cruz, Arch Dillard, Sandy Dillard, Joan Dziezyc, Marcia Effinger, Charles Ely, Jesse Fagan, Tim Fennell, Anthony Floyd, Bert Frenz, Brush Freeman, Lizzie Furuta, Kim Garwood, Sandy Gipson, Georgette Guernsey, Ron Gutberlet, Chuck Hamilton, Peggy Harding, Tyson Hart, Ruth Heino, Clinton Henderson, Petra Hockey, Doug Holder, Erik Huebner, Jim Hughes, Shirley Hughes, James Ingold, Diane Jones, Shrinand Karuppoor, Rich Kostecke, Cathy Liles, Guy Luneau, Mike Manson, Jason McClure, Chris Merkord, Dorothy Metzler, Charles Mills, Carroll Moore, Robert & Fran Moore, John Muldrow, Derek Muschalek, Jeffrey Musser, Bill & Charlotte Neill, Elaine Owens, Dewitt Patton, David Phalen, James Phelps, Randy Pinkston, Truman Powell, Sumita Prasad, Ellen Ratoosh, Eddie Ray, Jennifer Reidy, Karen Russell, Susan Schulze, Willie Sekula, Terry Smith, Gene & Dorothy Stanford, Ceal Sterling, Scott Summers, Rob Tizard, Robert Truss, Betty Vermiere, Darrell Vollert, Gary Waggerman, David Weaver, Carol Wells, Stan Welso, Matt White, Shirley Wilkerson, Judy Winn, David Wolf, and Mimi Hoppe Wolf. This web site is designed by Bert Frenz. Copyright © 2003 Bert Frenz. All rights reserved.